When starting out in Age of Champions on Facebook, you may be confused with all the options. There are quests, battles, raids, building armies, and more. Before you get in to battles, I would suggest you do quests. The beginning tier of quests not only offer a lot of experience points, but coin as well. By going through the quests, not only will you level faster than if you battled, you will also gain some upgrades for when you decide to start building your first army. 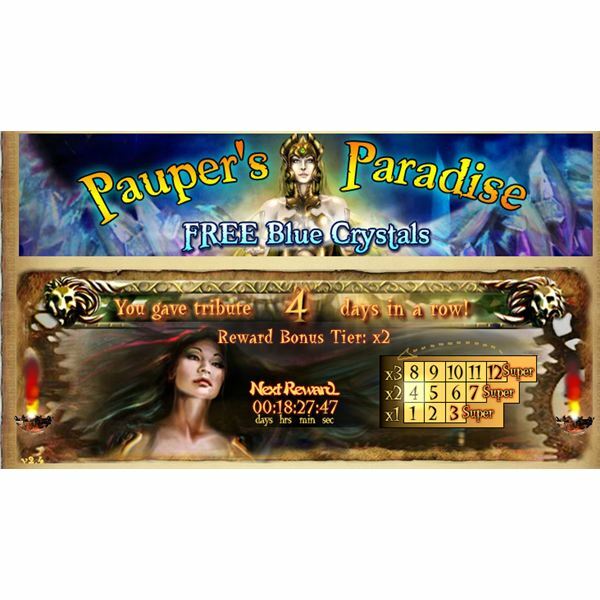 As you start gaining levels you will be rewarded each time with one blue crystal and 1,000 coin. You will also be given four points to use to alter the attributes of your champion. I suggest putting all your points in the Energy attribute. Energy is used for questing and raiding. The more you have, the faster you will level and you will be able to do more attacks in raids. After you reach 100 or so energy, you can start to put more into stamina and other attributes as you see fit. For the best results early on, I recommend going to the quests tab, then click tutorial, then click extra. There are many easy, low energy cost quests there that will allow you to level up quickly. The Dread Ravens quest is a good example. It costs one energy and counts towards your trophies under the player tab. There you can receive additional experience and gold for completing quests and battles. You should check the trophies section often. Whenever you have a reasonable amount of gold, use the bank feature to keep it safe. Putting your gold in the bank costs you ten percent, but it is well worth it. If someone decides to challenge you while you have a large portion of your gold out of the bank and they win, you will lose a large portion of that gold. When you put your gold in the bank, you avoid other players taking a good sum of it when you lose. Everyone loses eventually, so keep and eye on your gold and make deposits as often as you like. By now, you should have a good stockpile of gold in the bank. When choosing units there are a few things to remember. Higher units require more food but are well worth it. 15 Human Clerics will beat 30 Human Acolytes easily. 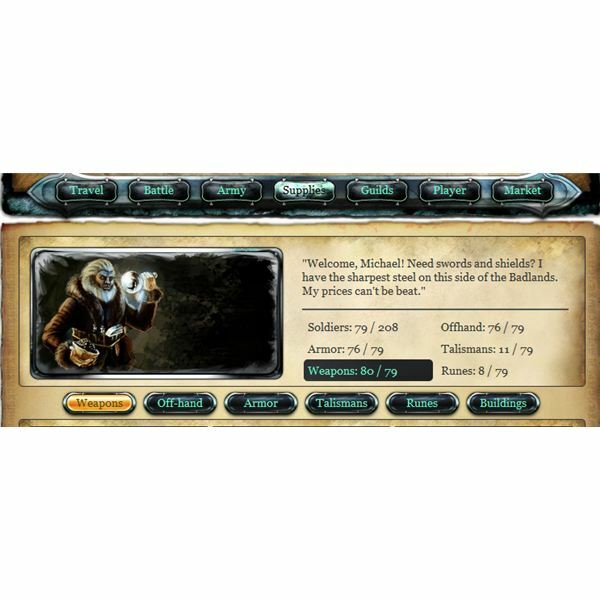 There are five types of units; Humans, Elves, Minotaurs, Titans, and Mercenaries. Human units will beat Elvish units. Elvish units will beat Minotaur units. Minotaur units will beat Human units. It is a good idea to have a nice mix of each unit to stay competitive. If you pick too many of one race, you may find yourself losing a lot of battles. Remember to watch your gold as you buy units. You will need some extra to buy weapons, armor and shields. At the beginning you will have three options that you should focus on when supplying your army in Age of Champions on Facebook. Weapons, Off-hand, and Armor. Talismans, Runes, and Buildings will come later. Now that you have your first army built, they need supplies for them to be effective in combat. Hopefully, you kept enough gold saved to buy a sword, shield, and armor for each unit. If not, buy as many as you can. Then you can start battling for gold to make sure each unit is properly equipped. Under the Supplies section you will be shown how many units you currently have as well as how many units you can have for your current level. You will see how many weapons, off-hands, and armor you have. Try to keep those numbers the same as the number of units you have. A poorly equipped army loses battles. 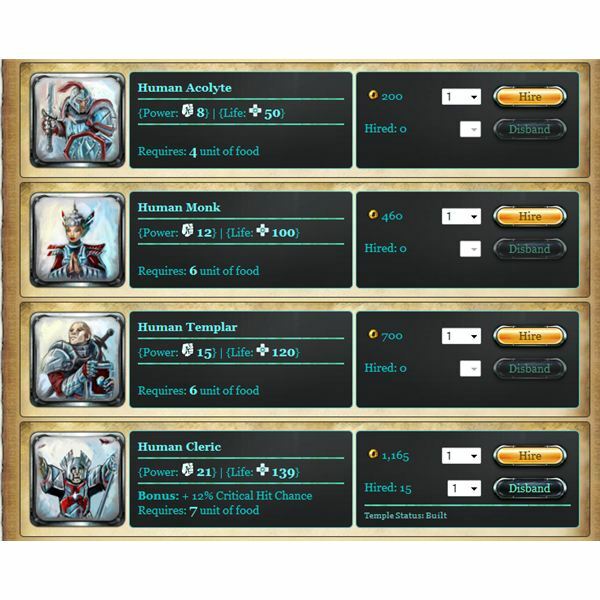 After you reach certain levels, you will notice upgrades in the form of new units and new supplies. It is a good idea to replace the old with the new, when gold permits. You are allowed to sell back units and supplies for gold so that you may purchase the new ones. When you are comfortable with your newly formed army, it is time to start facing off against other players. There are a few things to keep in mind when deciding who to attack – the number of soldiers compared to yours, the number of allies, their level, and their win/loss ratio. Once you have selected your opponent, click the invade button. Here, you have two options. You can either watch the battle play out, or you can click skip to the end. I would advise you watch the first battle. If you win, you have the option to attack that person one more time. If you would like to save time on what you have see to be an easy victory, skip to the end. Also, watch the amount of coin you receive from your victories. Before, we mentioned that you should deposit your gold as often as possible. Others tend to be forgetful and when you come across someone that yeilds a lot of gold it is a good idea to attack them again. Watch your stamina, when the bar starts changing colors you will notice a penalty from your army being tired. As your stamina dips lower and lower the penalty to your army's overall health drastically lowers. This can cause some easy losses against players you would normally defeat. Having allies is very important in the Age of Champions on Facebook. The number of benefits they bring are enormous. With allies you can send potions, alchemy items, participate in raids, unlock Titans and more. It is a good idea to get as many allies as you can. You are allowed to send items to your allies once every 24 hours. There are several ways to get allies. One option is to invite your friends on Facebook to the game. Another option is to apply for a guild under the guild menu. Once accepted, begin inviting them as allies. 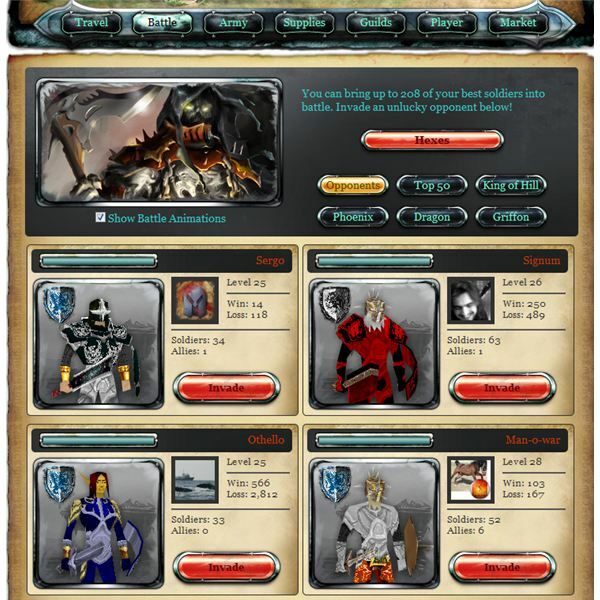 You can also find allies on various Facebook groups built by players themselves. This option will take some searching, but the benefits are worth it. Try typing "age of champions" in the Facebook search bar and look under groups. Some groups are open, others will require you to request to be added. Titans are very strong units, they are only available based on the number of allies you have. 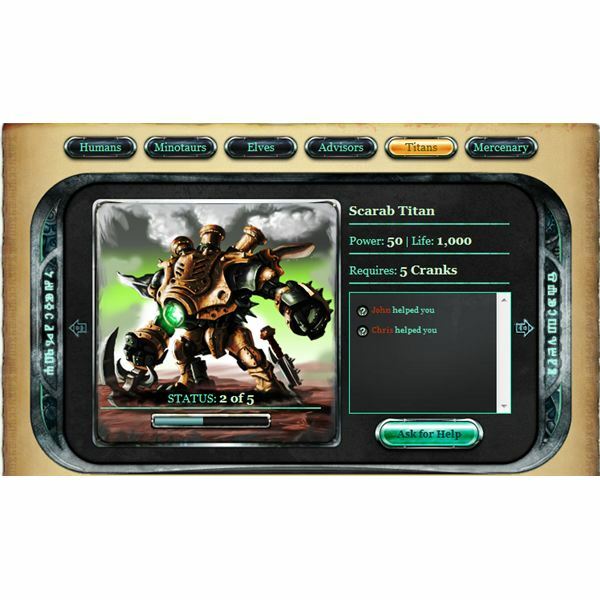 The first one, the Scarab Titan, unlocks when you have five allies. Titans need to be powered up by allies and only last for a little over a day. They can be recharged as often as your allies click the recharge option. Posting the request on Age of Champions group page is an easy way to keep your Titans charged. Blue Crystals are used to buy limited equipment, special units and more in Age of Champions on Facebook. The items and units are much more powerful than the standard ones. There are several ways to obtain Blue Crystals. The easiest way is buy purchasing them with money. If you are not in to spending money, do not worry, there are several other ways to receive Blue Crystals. One way is simply by leveling, as mentioned before, you receive one Blue Crystal each time you gain a level. Pauper's Paradise, on the homepage, is another easy way to get crystals. Here, you can get crystals by simply watching advertisement videos. These videos vary in length and are not always available. If you click "get more crystals" next to the number of crystals you have, you can scroll to the bottom of the page and find alternative ways to earn more Blue Crystals. These range from completing surveys, doing free trials, signing up for certain services you may be interested in, such as Netflix, or watching more videos. Unless you were fortunate enough to receive a great weapon upgrade from a raid, I would suggest using your saved crystals to purchase one first. Your weapon will be your best upgrade, especially for raids. After that, chest armor, shields and shoulder pieces would be your next upgrade. Available at level 10, you can either summon the dragon with a gifted staff from an ally, or you can join a public raid. Here is where your energy is important. Loot received after the dragon is based on damage dealt to the beast. The more energy you have, the more attacks you can do, which gives more rewards. Things to watch for when attacking any raid monster in Age of Champions on Facebook are group health, your energy, and time left to defeat it. Energy should be used on strong attacks rather than regular. Strong attacks cost 20 energy, while regular attacks cost five. 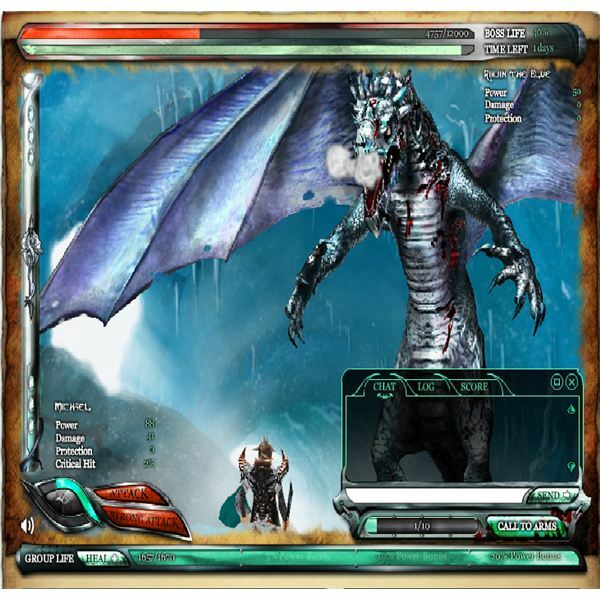 Overall, strong attacks deal more damage and a critical strike with a strong attack can be devastating to the beast. As for group health, if you see it dipping under the 20 percent power bonus, spend five energy to bring it back up. You want to be doing the highest possible damage to end the raid quickly in order to move on to the next raid. A collection of other articles to guide you through Age of Champions for Facebook.